IN STOCK AND READY TO SHIP!!! 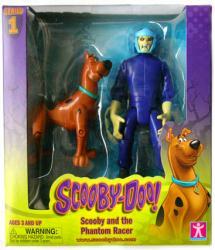 This is an action figure 2-pack including a 3 1/2" Scooby figure and a 5 1/2" figure of the Phantom Racer from Series 1 of the Scooby-Doo! line of action figures. The figure set was produced by Charter Ltd. and remains new and sealed in its original NEAR MINT packaging.